Dipak Das, the former University of Connecticut researcher found to have committed more than 100 counts of misconduct, and who passed away last year, has had another retraction appear. We were recently alerted by an anonymous tip that at least two paragraphs in the title review  appeared to be copied verbatim from papers by other authors without attribution. Upon checking these facts we have established that in addition to the parts brought to our attention, large portions of the review are made up of paragraphs copied verbatim from other reviews or books, sometimes cited, but mostly presented without any references other than to the corresponding original primary literature. Discover blogger Neuroskeptic, whose interests in the integrity of the scientific literature often intersect with ours, was the anonymous tipster, he tells us. The paper has been cited three times, according to Thomson Scientific’s Web of Knowledge. It’s Das’s 20th retraction. It was indeed me. While Das has had 20 retractions, this is his first for plagiarism AFAIK. I actually didn’t realise this paper was by “the” Dipak Das until after I’d worked out that it was plagiarized. 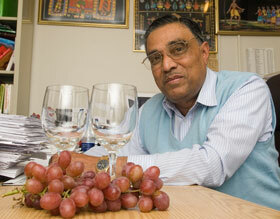 That bunch of grapes on his desk and the two wine glasses tells a deeper story than just anthocyanins. What is astonishing is how could 100 counts of misconduct have been committed right under the noses of co-authors and university authorities without any red flags having been raised for years, even by editors, peers, or publishers? This indicates not only a dysfunctional researcher, but an equally dysfunctional system into which he was inserted.